As the annual Winter Meetings begin to wind down the Rule 5 draft took place on Thursday and the Phillies lost a player while gaining another. Right-hander Kevin Munson was selected by the Phils from Arizona while the Mets took righty hurler Seth Rosin from the Phillies. With Double-A Mobile in 2013, Munson was a mid-season All-Star, posting a 2-2 record with a 3.41 ERA, 13 saves and a .157 batting average against in 29 relief outings. Following a promotion to the Triple-A Pacific Coast League, which is often considered tough on pitchers, the six-foot-one 215 pounder sported a 0-2 record along with a 5.09 ERA, one save and a .269 batting average against in 24 relief appearances for the Reno Aces. Additionally, Munson combined to tally a 10.87 K/9 mark at the two levels last year. Scouting reports on Munson state that he has a low-90's fastball and a plus slider. He projects to be a late inning reliever. Munson was a 4th round draft selection by Arizona in 2010. In five outings for Hermosillo in the Mexican Winter League, Munson has 1.59 ERA with two strike outs and one walk through 5 2/3 innings. Rosin, also a Double-A All-Star last season, with Reading, was acquired from San Francisco in the 2012 Hunter Pence trade. In 26 games (23 starts) with Reading last season, Rosin sported a 9-6 record with a 4.33 ERA while striking out 96 and walking 35 in 126 2/3 innings. This is the second straight year the Phillies took a player from Arizona. Last December, the team selected outfielder Ender Inciarte from the D-Backs, but lost him back to Arizona. Rules require the selecting team to keep the selected player on their 25-man big league roster for the entire 2014 season, or offer him back to the team he was drafted from. 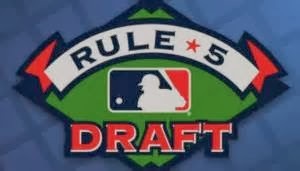 Players are eligible for selection in the Rule 5 draft when they are not on their major league organization's 40 man roster and 1) were signed to a contract at age 19 or older and have been in that organization for four years, OR 2) were signed at age 18 or younger and have been in that organization for five years. *Update- Rosin was swiftly traded by the Mets to the Dodgers. The same Rule 5 requirements of sticking on the major league roster will apply to Rosin with his latest new organization.